I mean, does a t-shirt get any better than this one? I'm completely obsessed with it. I love mixing oversized tops with skinnies and especially leather skinnies. The shoes, the bag, the bun--all of it, it's just so fun. Definitely one of my favorite date night looks! P.S. Don't forget to enter my Ray Ban Giveaway below! What an interesting tshirt! The cut is fun and the graphic is so cute. I love that you paired it with the leather pants! Such an elegant and classy look ! Love it ! my fav look of urs yet megan! AMAZING! you look stunning! Such a cute top! Love how you styled it too! I love your bun!!! Do a tutorial on it!! Buns are the best!! That top is adorable! I'm obsessed! I LOVE and WANT that top!! so cute.. Such a fun top! I love it! Oh my goodness, the top is so fabulous and fun. I love the look! That top is so cute! I need it! I LOVE that top-- and it looks great with those sunnies! That shirt is FABULOUS! I am in love! I love this whole look. Too cute. SO IN LOVE with that shirt! May have to make a purchase :) You paired it perfectly with the leather pants! Ur top is too cute ;) Lovin' the leather pants! Pleaseee do a tutorial on how to do that hair!! Please! Love it!!! super cute top!... 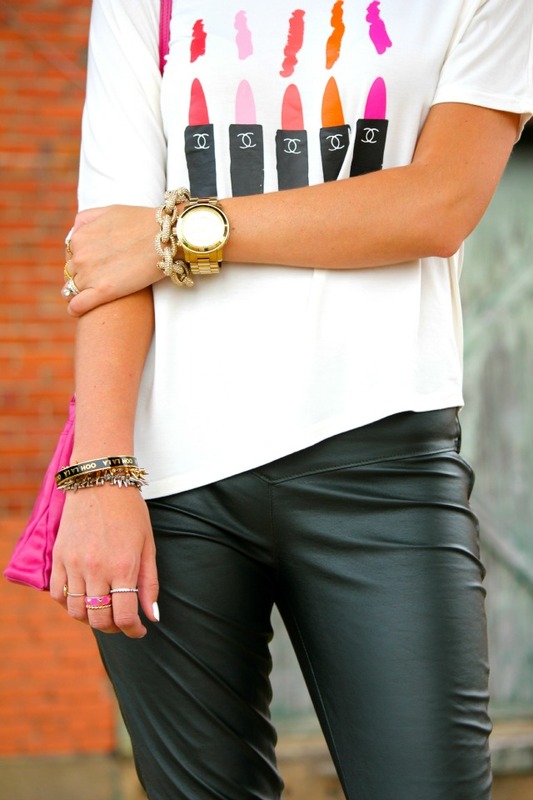 love how you paired it with the leather denim!